The amount of total accounts you should have depends on your current financial situation. Your overall credit score does NOT take the number of credit lines you have into account. However, they do factor in your payment history and utilization of credit. Payment history is simply making on-time, consistent payments. This person has an available credit line of $18,000 and they’ve utilized $4,400 of that. To find the utilization, you divide what you have spent by your credit line, which in this case would be 24.4%. Your goal should always be to have your utilization ratio 35% or less. Accounts like student loans, mortgages, car payments, etc. are also part of your credit line. Paying off an auto or student loan may lower your credit score initially. Why? The overall length of time that you've had an account affects your score. If you’ve had a student loan longer than any credit card, your length of time will be affected once this closes. The effect from this payoff disappear quickly over time. Applying for a new card can also make your credit score go down. When applying for a new card, the lender makes a hard inquiry on your credit. These inquiries may stay on your credit report for up to two years. However, your score should recover before the inquiry disappears. SO, HOW MUCH CREDIT SHOULD YOU HAVE? If you have a tendency to rely on your credit cards, you need to find a healthy balance between credit limit and your utilization. Before opening any new accounts, ensure you are in a situation where you're ready to undertake all it entails, including payments, fees, and interest. 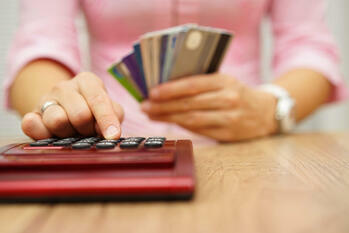 Have a buffer, at least 3 to 6 months, in between credit inquiries to prevent your score from dropping. Too many active accounts has the potential for you to forget about payments that are due while too little credit could prevent you from receiving that home loan or job for which you've applied. It's a major balancing act that requires great care. Finally, it's easy to fall into a pattern of credit card debt. As long as you use good judgment when opening & using accounts and keep up with payments, your credit score will remain solid.